BigDog - First off, good to have you on board and best of luck...secondly, as to being late, if a certain Canadian can be excused because his dog ate his calendar then you're not a problem. An aside, have you looked over on EBAY Brasil...some interesting cars available at not bad prices - have a Team Slot Jaegermeister Renault Alpine for 120 Reais or about $60 USD. How stupid can I be...?!?! "... An aside, have you looked over on EBAY Brasil... have a Team Slot Jaegermeister Renault Alpine for 120 Reais or about $60 USD. Where did you find that, DV? Can you post the link to the page...? Thanx in advance! Last edited by BigDog; 12-18-2006, 01:23 PM. Glad to have you in the race, BD! If you were anywhere else, I might not be quite so understanding, but I've delt with Brazilian customs!?! Your country is the most difficult place to get things in and out of! I just hope that the GPR boys did their homework with the required paperwork when the cars come to the warehouse! ...not a recommendation - just noticed it was at a fair price. "... Your country is the most difficult place to get things in and out of! I just hope that the GPR boys did their homework with the required paperwork when the cars come to the warehouse!" The Brazilian customs clearance will be my most demanding job for 2007 , but fortunately, last Saturday I got together with this old friend of mine that is retired from the Customs Office, but that was once a bigshot there. He will give me the name of the guy that will help me through the legal maze that constitutes Brazilian import/export legislation. I'll have to arrange for what is called a "temporary importation". He said he'd help me, if need be. BigDog - Glad to help - I did a "buscar" for "slot it" and only a few parts showed up. Lots of Ninco's, but at sorta high prices...then again shipping would be quite less? Sounds like you have it well in hand, BD, I can't wait to see the cars flying around the warehouse! Looks great, Doc! Where did Fernao get that cool Mario Andretti helmet? ...it does share the same tail lights with one! 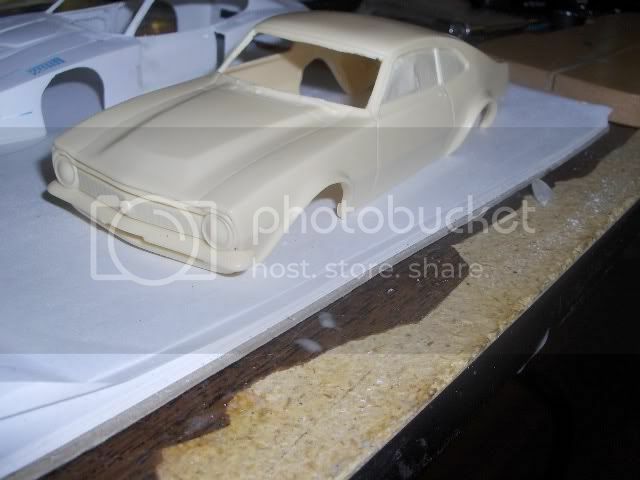 The Maverick bodyshell is really nice and seems accurate, from that photo at least. Looks to be a 'non-Grabber' model (that one had fake air intake scoops on the hood). ...or in plain ol' street trim, but with a nice fast chassis underneath. Sleeper!